Why Does My Bird Bite Me so Much? 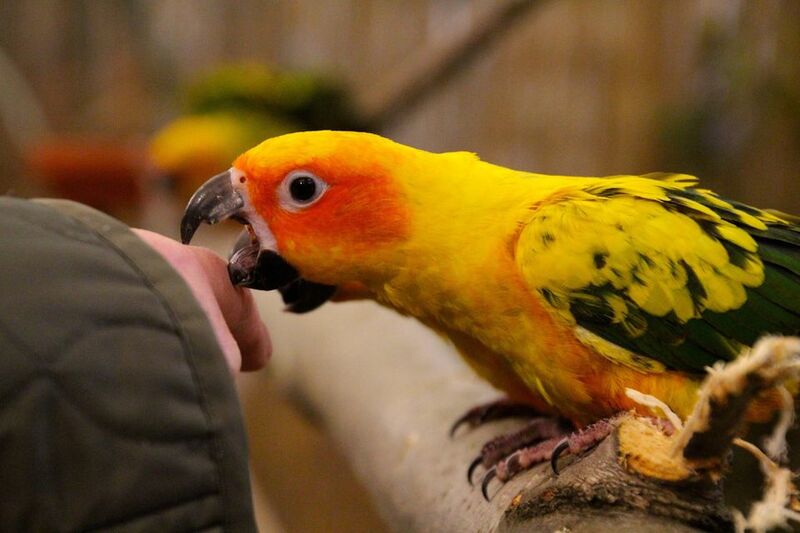 When your pet bird bites your hand, you may be being beaked rather than bitten. Birds use their beaks to grasp items and maintain balance. Chances are that your bird is not trying to be aggressive, as biting is not a natural fighting behavior for birds. Learn how to tell the difference and what to do when your parrot or another type of bird gives you a bite. There are several reasons that a bird might beak you as opposed to giving you a true bite. Birds use their beaks as a third hand or to test perches before they step on to them. Bird owners often confuse this with being bitten. While being beaked may not be the most pleasant experience, it is much different from being bitten. A bird's beak contains a myriad of nerve endings, and it is used to sense taste, texture, resilience and in general check out its environment, including its owner's hand. One way a bird may get inadvertently trained to beak you is if you let out a little yell when you are beaked, especially when the bird is young. Birds, especially parrots, think your yelp sounds like a positive response. The bird will think you are praising it rather than protesting. This is the opposite of what you may be used to when training a puppy who knows your loud reaction is negative. Birds are simply different. Birds will dish out a true bite now and then if they are frightened, startled or feel cornered. These bites are often quick and hard—and the bird's body language will let you know that the bird did it with the intention of causing pain. Many times a true bite will break the skin or at least result in a painful dent. It's easy to tell the difference between being bitten and being beaked. Once you have determined what's happening, it will be easier to learn how to deal with the behavior. If you are being beaked, the only real option is to put up with it. It's a fact that birds use their beaks in this way and the most experienced bird owners understand that it's all just part of owning a bird. If you are in fact being bitten, however, there are steps that you can take to help put your bird at ease and curb this undesirable behavior. To correct bad behavior in birds, you must not get excited or call out. Instead, use a frown and body language that shows you are unhappy. Speak calmly and softly to tell your bird that is not acceptable behavior. Place the bird in its cage or on its perch. Give the bird a few minutes of time out on its perch. Then resume interacting with your bird in a positive way. Instruct any guests to expect beaking at times and not to react to it in an excited way. This can help prevent your bird feeling threatened, which could result in a true bite. Young children may not be able to handle a bird correctly and could be injured by a bite or beaking. Be sure to use caution with your bird around young guests.